Pondicherry, a French colony until the 1970’s, was located 4 hours south of Chennai. The guidebooks claimed it is a French/Indian fusion town and it is true to some extent. 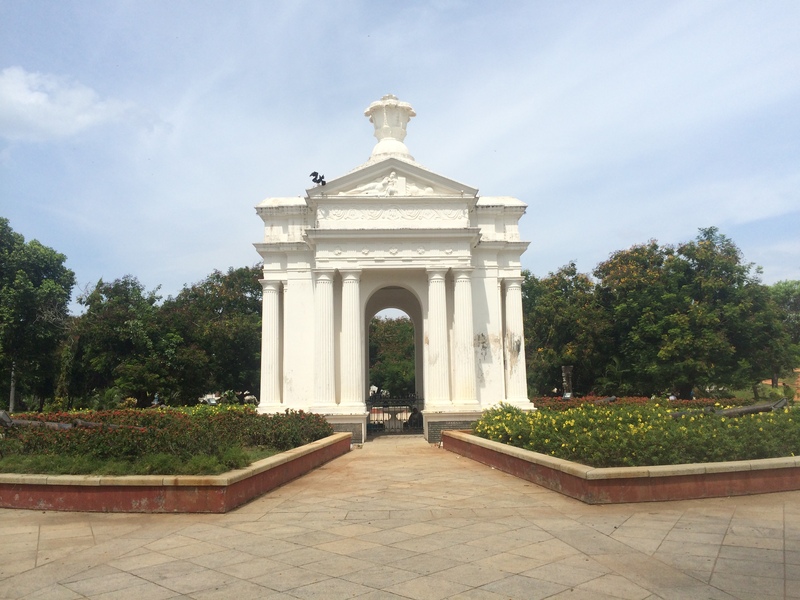 While Pondicherry does have a lot of positives unique to India, in general I was disappointed. That said, I actually met other foreign tourists here and they were awesome! No cars or motorbikes! It’s a miracle. After getting off the bus, I caught a rickshaw to the Natura Ashram. It cost just 200 rupees (about $3.50) per night, so it was a steal. An ashram guesthouse is not a normal hostel, it is a community that hosts classes, usually yoga classes. People who stay here have to abide by rules (early curfew, no alcohol, cigarettes) in exchange for being admitted into the community. The ashram I stayed at did not have yoga or meditation classes, although most of the people here did meditate. Rather, it hosted daily classes that helped people develop as people or professionals including technology classes, English classes, or discussion circles. Perhaps the best part of the ashram was that I was able to meet like-minded travelers from other countries (I’ve only met domestic Indian tourists thus far). My new friends included Kendall from Chicago, Megan from Canada, and Francesco from Italy. Together we wandered the streets of Pondicherry. Because the ashram was located in a non-touristy section of town, the locals were not used to seeing tourists and were extremely friendly. The little kids that played in the streets and their moms kept asking us to take photos of them. We had some very fun photoshoots. They really loved looking at photos of themselves for the first times in their lives. Those reactions were priceless. One of many photoshoots with the neighborhood. The French section of Pondicherry is actually a very small part of the city. Most of the city was just like every other Indian city: hectic, dirty, and full of honking and haggling. However, there was the small corner of the city, that actually was peaceful. Very few cars or motorbikes went through here and the there were some (mostly ruined) French mansions. This was what most people (including myself) imagined Pondicherry to be like. There were a few cafes that serve Western/French food but actually most of the places were abandoned or not open to the public. Finding food was actually extremely difficult and overpriced so most of the time, we left the French quarter to eat Indian food where you can buy an all you can eat South Indian meal for less than the price of a glass of pineapple juice. The French area, called White Town, did have a nice park and a nice stroll along the Bay of Bengal. However, there really was much else to do in Pondicherry. Most of the time, we all just hung out in various cafes serving mediocre continental food and free Wifi. One day, we went to the Botanical Garden, which was a huge disappointment because it was so unkempt. However, it did have a working train called the Joy Train, and we all rode it together. Everyone agreed that riding that toy train was the highlight of our stays in Pondicherry. Since many of my new friends are women, I learned a lot about being a solo female traveler in India. Unfortunately, they had some very negative things to say. They said that everywhere they went, virtually every male over the age of 10 would cat call them or somehow try to flirt. This got so bad that they did not want to walk around the streets unless necessary. They were told to never go out after dark. However, when they walked with me, nobody said talked to them. When we were in restaurants, the waiters would often only talk to me and I would order for the table. 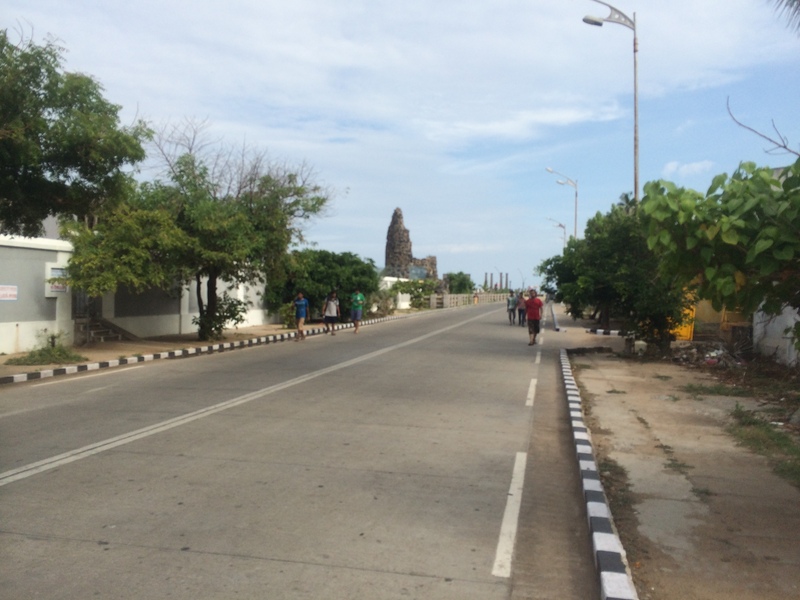 While there was a beach near Pondicherry, women did not swim there because they will be constantly harassed by men. This was really disheartening to experience since Kendall and Megan were just as capable travelers as any male. I’ve heard that the gender inequality in India was great, but witnessing firsthand definitely opened my eyes and made me much less enchanted by the Indian culture. The most interesting thing in Pondicherry was to stroll the ocean road at sunset when half the city of 400,000 shows up. The government banned motorized vehicles so it was actually peaceful in the sense that there were no honking horns. Some people were trying to film a TV show similar to American Idol. They set up a huge set with lights and cameras. However, the speakers didn’t work (classic India) so they had to cancel the performance. One day, we went to the movies with an Indian girl we met at the Botanical Garden. She studied electrical engineering in college, but instead was going to work at a call center. She told us that she had a boyfriend and that they sometimes talk on the phone. We asked if they ever hang out in person and she said absolutely not. We were all sort of confused what the point of the relationship was if they don’t (most likely cannot) see each other for even a cup of coffee. I have heard that Indian culture is changing a lot, so I’m curious what the culture was like here 20 or 30 years ago. Anyways, we went to the movie, which was a Tamil comedy. The entire movie was in Tamil with no subtitles. Still, we were able to understand the plot. Overall, the movie experience here was very different from the US. All movies were 3 hours long and had an intermission. People shouted and clapped a lot during the movie. A lot of people, including our friend, took phone calls during the movie. 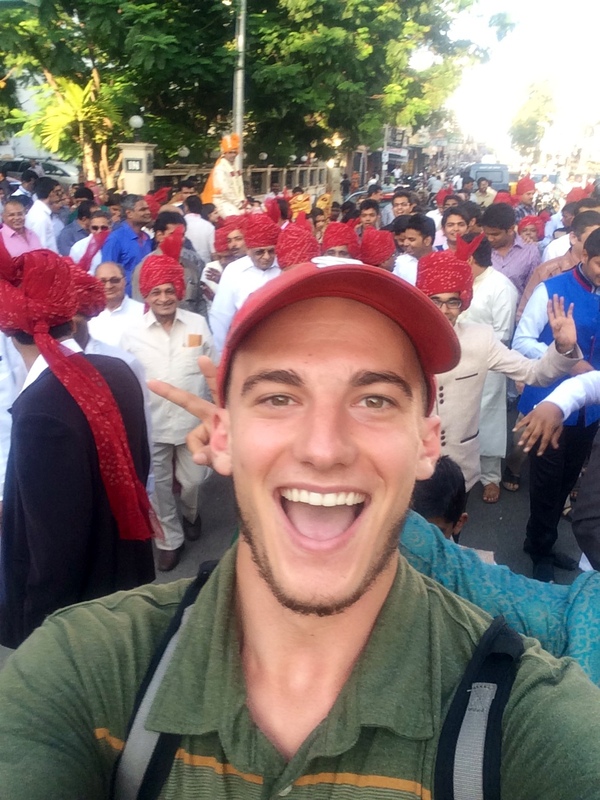 The whole experience seemed very India, which is to say very crowded, rowdy, and full of personality. Wedding parade selfie. Definitely want this to happen for my wedding. After the movie, we walked outside to see a marching band randomly walking down the street with masked dancers and a man dressed like a maharajah on horseback. Turns out it was a wedding and they were marching down the street to celebrate. I kind of danced along to the music and suddenly I was pulled into the center of the parade with the male family members of the groom. We danced together for about 3 minutes before I was shoved out of the circle just as quickly. Those 3 minutes were magical and random- my favorite qualities of India. 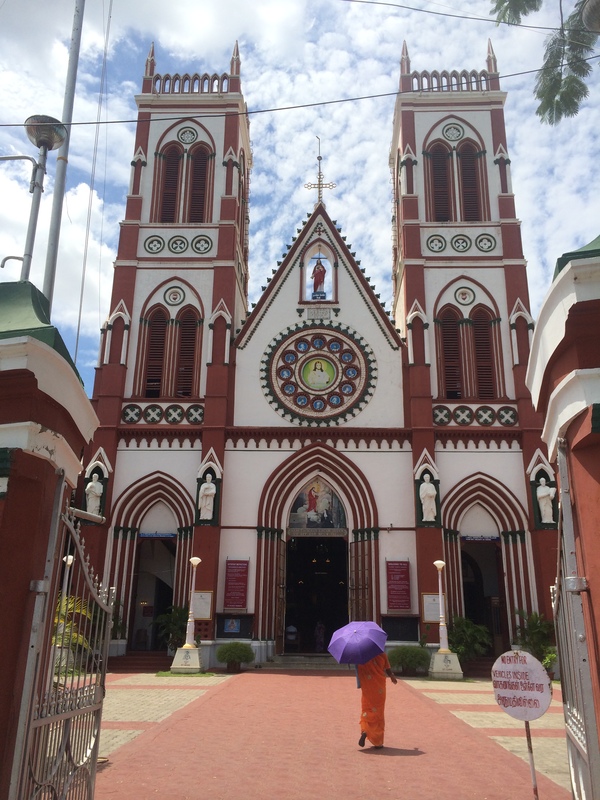 Overall, I was disappointed with the vibe in Pondicherry. Life of Pi definitely mad it out to be a better place than I think it is. If I were to stay here again, I would probably want to stay in a nice French manor, but there are much closer places to the US to stay in a French villa (such as France). I think I would appreciate it more had I visited Pondicherry later on in the trip since I’m still enchanted by the hustle and bustle of India, while many of the travelers here are tired of it. 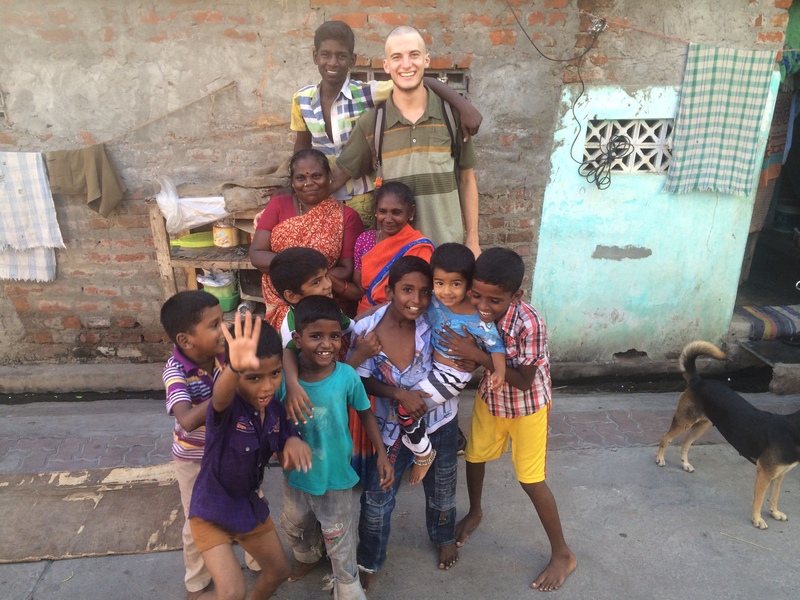 The saving grace for me was the people in the ashram and in the surrounding neighborhood.